Click here to navigate back to the Travel main page. Click here if you just want to see pictures of the trip. This was going to be the first holiday Sue and I would have together, alone, without the boys, since Andy was born in June 1987 so it had to be something special. Once we had decided the destination (West Coast of America) it was time to knuckle down and do the planning. Starting point was all the on-line guides and organised tours – there were so many to choose from but all had one thing in common – they were expensive and outside our budget. The dream would be to do Route 66 on a Harley Davidson, but, at $125 a day rental, plus fuel and mileage costs there was no way – not this time anyway. First we decided a compromise – we’d fly into Phoenix and drive to San Francisco doing as much of Route 66 as we could and taking in as many national parks and tourist sites as possible. Then we registered with a number of websites that advertise cut price air fares and religiously opened every email that came in – sometimes ten a day – and followed up the links. Eventually we struck lucky when BA announced a “sale” and we got the flights we needed at a cost that would be in budget. Next was to repeat the exercise on car hire, which we did and again struck lucky when Dollar announced an “Easter Sale”. Bearing in mind that in 1998 I’d paid £347 just for car hire insurance for a trip to Florida, when this worked out at just under £220 for a Dodge Stratos coupe all in, fully inclusive of all insurances, mileage and first tank of fuel I was over the moon. So with flights and car hire booked it was down to planning an itinerary. Luckily several of my work colleagues have visited west coast America (some having lived and worked there) so I wasn’t short of ideas. It all came together and we very nearly stuck to the final, refined itinerary. The following is my account of that holiday written up from the scanty notes I made each night. I hope it in some small measure inspires others to try something similar – it is worth the effort. A busy American highway - Somewhere between Phoenix and Jerome. Left Derby at 8:15 as planned. A good drive down the M1, A43, M40, M25 into the off-site car parking near Heathrow. The directions and weather both good. Parking is organised and trouble free and we are delivered into the chaos that is check-in at Heathrow. With masses of people about we queue for 35 minutes to deposit our bags, chatting to a couple from Phoenix as we wait who were flying home after holidaying in the UK, which they said it was expensive. Once the bags are deposited we are free to explore so we head into departures where Sue is randomly selected for a full body search. I’m shown to the express queue which takes 15 minutes to process, and then I’m in and back with Sue. Duty free shops, cafes and bars and the small matter of nearly 4 hours to kill. Take-off is delayed from 14:35 to 15:15, but, we land in Phoenix at 17:15 local time as scheduled. Long haul flying is boring, despite being sat next to a talkative senior lady from Wilmslow, Arizona who had spent a wet two weeks visiting her daughter in Manchester. The queues on arrival at Phoenix immigration had to be seen to be believed – we had to give prints with both index fingers and have an eyeball scan of our right eye. All in it took just over ¾hour to get cleared. The signage out of the airport was very poor for those like us trying to get out of the terminal. We had to get a bus from the terminal to the car rental building where our pre-booked Dodge Stratus Coupe became a Ford Taurus (Yuck!) at the desk, where a $250 deposit became the first (unexpected) hit on the credit card. We then had to go down a level to “the garage” (car park) where the Ford Taurus became a free upgrade to a Dodge Caravan MPV (Chrysler Grand Voyager in the UK). This is our 3rd visit to the USA and our 3rd Dodge Caravan, but, this one is a nice Burgundy Red colour, has just over 10,000 miles on the odometer and is on California plates. The guy running the garage tells us that the Stratos we’d booked isn’t due in for a couple of days and the Taurus isn’t back from repair! We don’t care and drive away in luxury in a vehicle with which we are immediately familiar. We got lost getting out of the airport but still got to the Wingate hotel without bother, recording just 8 miles - only one more than forecast so not a bad start. After dumping the cases in the hotel we walk out and across the road to Durrants for some posh nosh, but, we were too tired and paid for the most expensive meal that we nearly ate in the whole of the holiday. We retired to a much needed bed around 21:15 (local time) absolutely dead beat. Up at 7:00 and into a beautiful shower and I remember hoping they are all this good. Down for a buffet breakfast then a walk about outside for a few photos before leaving at 8:00. Eventually found our way onto I17 North, then off to Prescott Valley (nice and modern, clean and fresh looking) then Prescott (nothing special despite being a recommended town to visit) and found a nice big local man who gave us directions to Sedona after we stopped having thought we’d missed a turn (we hadn’t). A few miles later we stopped again in a road-side lay-by to take photos of a picturesque lake. The road winds it’s way (more bends than we’d been expecting) towards Sedona taking us through Jerome – a lovely, under developed, small, old town that is just starting to benefit from tourist spending. We stopped and had a walk around, more photos and some video. It’s very Country & Western in style, and quaint in an American sort of way. There’s a team of horses pulling a cart round for tourists to ride, but, they’re a bit smelly so we give it a miss. 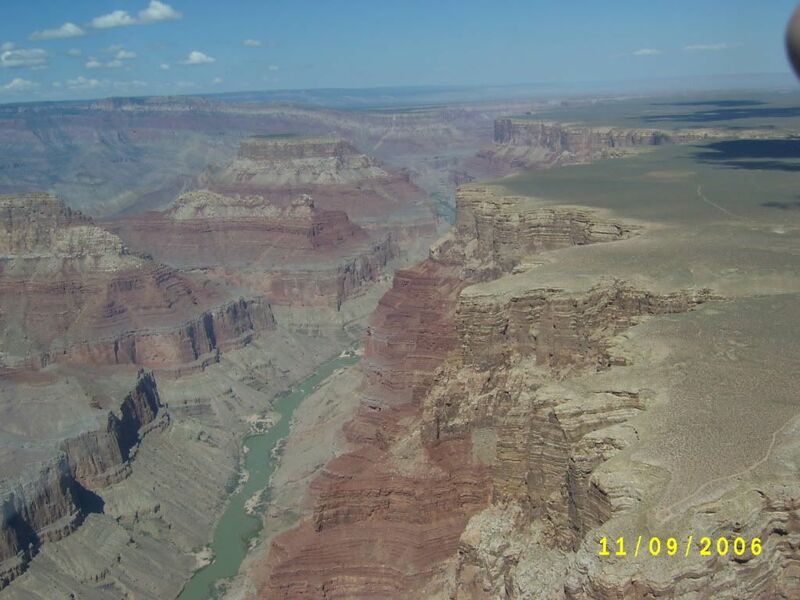 The Grand Canyon - spectacular views, best seen from a helicopter flight. 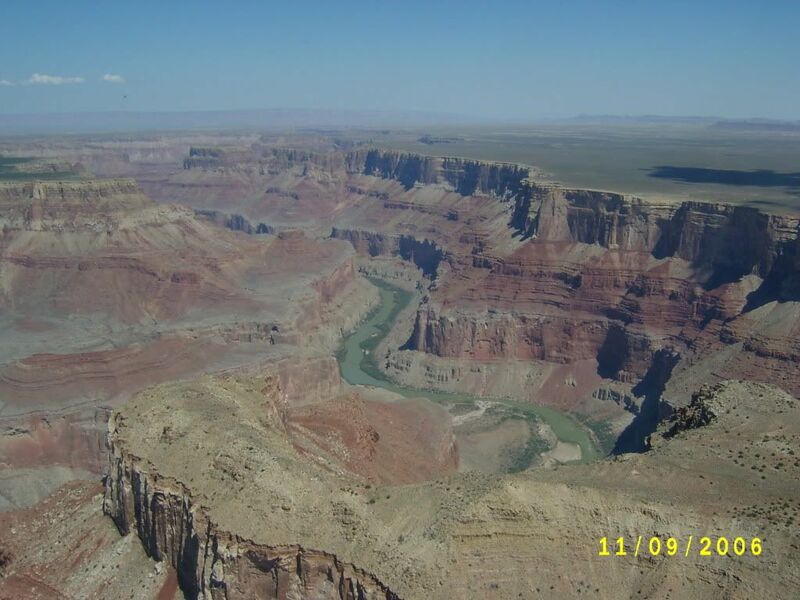 The Grand Canyon - one very big, very impressive, hole in the ground. 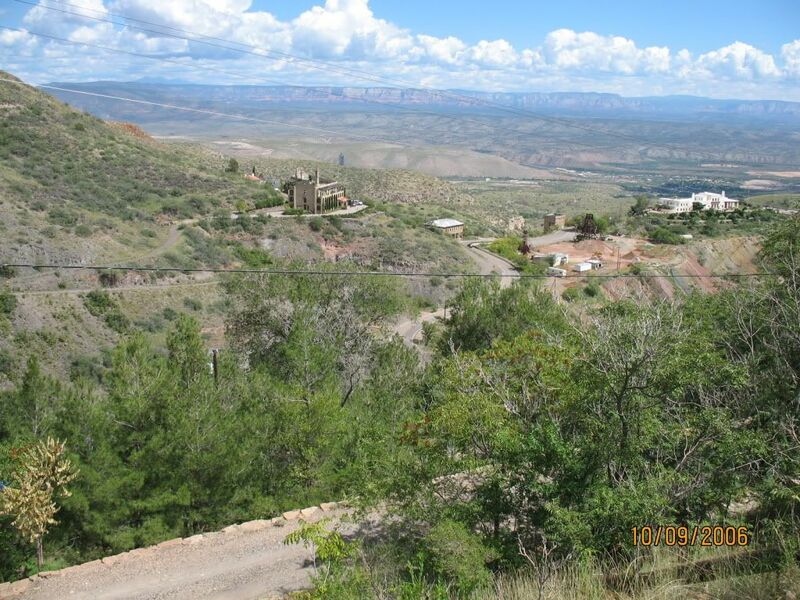 The road from Jerome is just as winding as the one that got us there, but we arrive in Sedona feeling pleased with progress on this our first day. We start at the Tourist Information Office, then walk up the street to the Cowboy Club for dinner when we are served by Kim who is obviously eating for two. We enjoy a nice relaxed lunch (with a beer) before continuing our walk up the street, crossing over and back towards the van. Nice place that is obviously focused on getting the tourists in and spending money. We didn’t like the pushy Timeshare reps but I did like the Route 66 t-shirt Sue bought me here. We carried on to Flagstaff and as we drove past the “City Limits” sign we drove into the tail end of a thunder storm. Everywhere was fast flowing water and BIG puddles. Pulled into a motel car park but decided to stay in the van because of the depth of the water outside. Looking around we can see blue skies to the north so decide to carry on our journey. We are now on Interstate 89 and heading north having somehow missed I Highway 180 (our chosen route) however, this takes us past an old steam train and runs parallel with the railway tracks, which at the precise moment we are passing has a couple of very long trains passing, one in each direction. As we drive out of Flagstaff past the “City Limits” sign we pass the end of one of the trains which appears to be roughly 3 miles long. We also see the end of the rain and within a mile we are back on bone dry roads that show little sign of having ever seen water. only 5 cars on the whole 38 mile trip, and with the sun starting to set we find ourselves at Gray Mountain checking out an Anzi motel. It’s clean but stank of disinfectant so we again decide to carry on to Cameron and the Cameron Trading Post where we rent room 205, very nice, with balcony and a lovely view. We fall into bed at just gone 7pm and slept like logs. Cameron Trading Post is Navaho Indian owned and run and an excellent place to stop with all facilities you could need on site – excellent, and recommended if you are out that way. A 7am start – muffins for breakfast, took some photos from the balcony before setting off. I wanted to fill up the car but the pump was so slow that I gave up after 8 gallons. We take Highway 64 into and through the Grand Canyon National Park making a number of photo stops, including the Watch Tower (which is a replica based on the original which was in a different location). We arrive at the G.C. Airport to find that we’ve been up graded to a first class flight, so we have to drive further into the airport to another location. 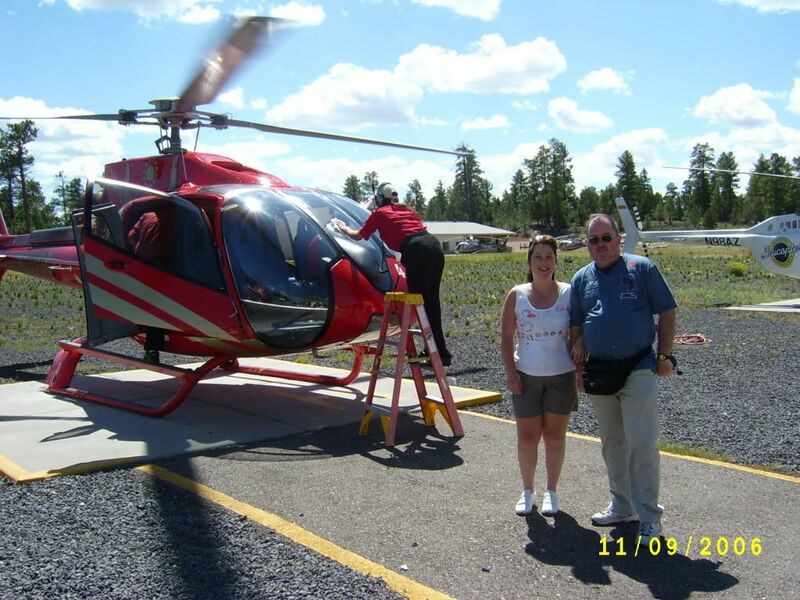 Bright red helicopters – and after 30minutes wait we are off, Sue and I in the front with the pilot and 3 big American guys in the back. FANTASTIC! PHENOMINAL! FLAMING GREAT! I am totally gobsmacked. Less impressive is the prices charged at the McDonalds’ just down the road where we decide to get a bite before setting off for Utah. Two chicken burgers with fries and a drink for $17 (milkshake was $4.95 plus tax) is expensive, and another (American) couple was so put out they cancelled their order. Once consumed, we are back on Highway 64 to Cameron Post where we pick up Interstate 89, heading up towards Paige. 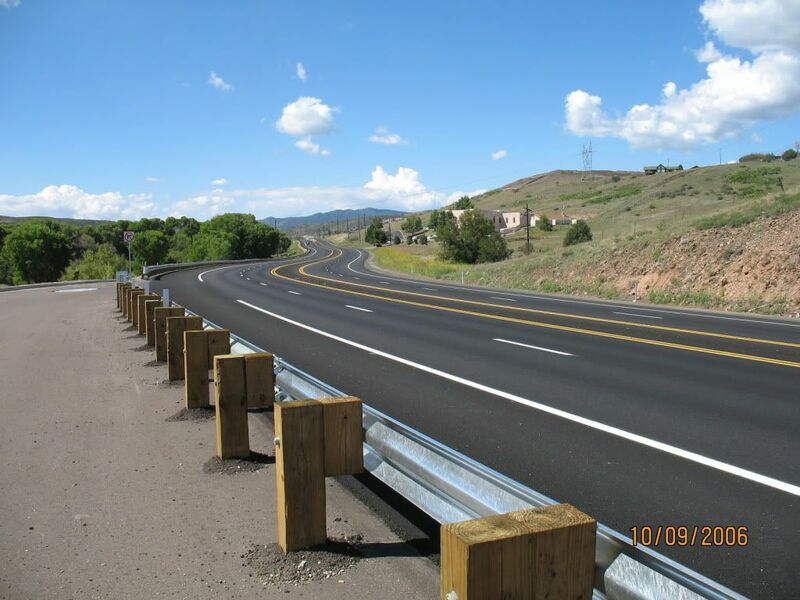 The road is mainly two lane, with alternate third lane on the uphill sections so that cars can pass slower moving trucks. The Grand Canyon - cleaning the bugs off the windscreen after out flight. 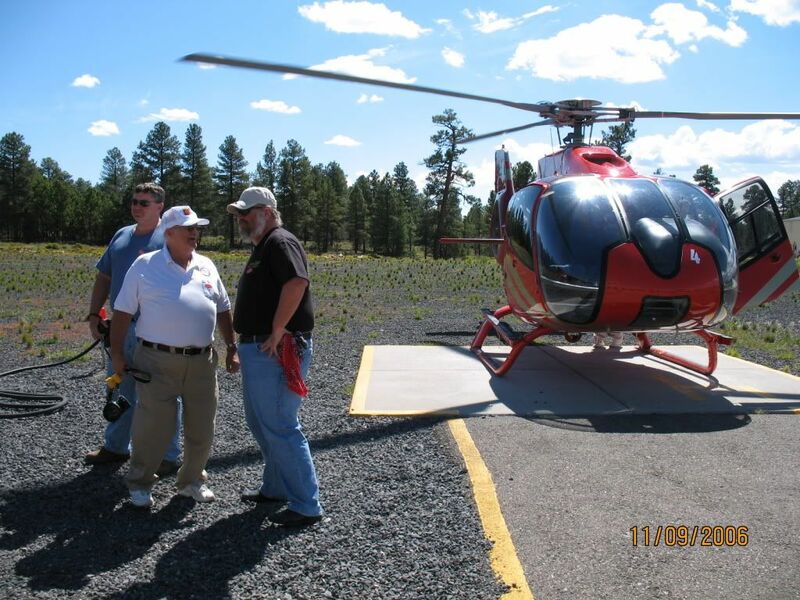 Our flight companions - and the helicopter we flew in over the Grand Canyon. We were in the front with Sue sat next to the pilot and these 3 guys were in the 2nd row of seats. As the ground crew closed the cabin doors they warned the pilot that the flight was over weight. The scenery is fantastic, an escarpment on the right (east) and rolling plain on the left (west) to the point where we pick up the Alternate I89 across the Navaho bridge heading towards Kanab, Utah. We find that the scenery just keeps changing. Long straight sections of road then winding sections. Big open views on our left and sheer rock face on our right (north, as we are now heading west). We had thought about stopping at Fredonia but while refuelling at Jacob’s Lake the attendant recommends we continue to Kanab and as we drive through Fredonia we can understand why, it is such a dull, drab and dismal little town covered in dust from a local quarry, that we decided to carry on to Kanab. What a difference! Found the local Holiday Inn with little trouble, booked in to room 324 then went back to a Pizza Hut we’d passed on the way in for a meal. Had to move the clocks forward an hour so retired to bed at 9pm local time. After rising at 8am and breakfast in the hotel we continue our drive up to Bryce Canyon. On the way we make several attempts to ring / text the boys back home but neither of us can get a signal. We pass the turning for Mount Carmel but decide not to detour from today’s plan. The road takes us into Red Canyon, where we stop to take more photographs, before driving on into Bryce, passing Ruby’s Inn (which is showing a “Vacancies” sign despite turning down my attempted reservations. 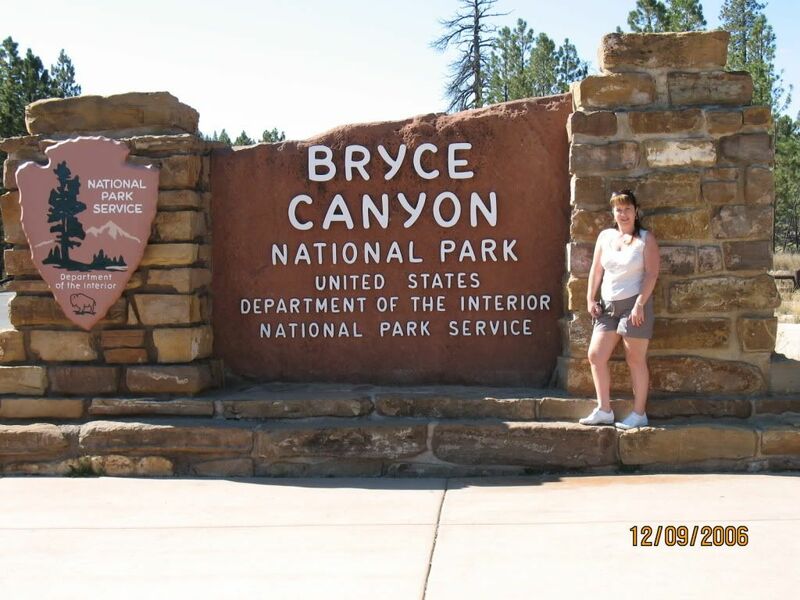 Once into Bryce Canyon National Park we stop off at Sunrise Point, and walk round the rim to Sunset Point. From there we walk down into the base of the canyon and back up which is about ¾ of a mile each way, steep with lots of switchbacks (i.e. a zigzag route) between top and bottom. By the time we get back Suzie’s legs are killing her. I lost a lot of sweat and took lots of breaks but as we have already got into the habit of carrying fluid (I take water, Sue takes Pepsi) so we manage ok.
We drive right to the end of the road into Bryce Canyon with several stops before returning back the way we came (it is a dead end road to nowhere). We stop at Ruby’s on the way out where they refuse to copy photographs from SD card to memory stick, but, at least we manage to use their internet café to email back home and pick up emails sent to us on my hotmail account. In summary, we are not impressed with Ruby’s at all, not the level of service we’d been lead to expect. 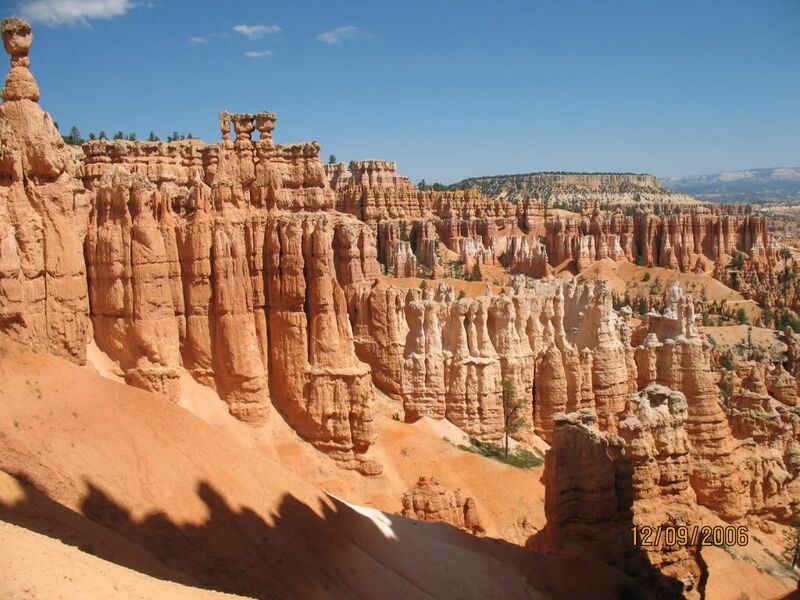 We decide that if possible we’d like to drive through Cedar Breaks National Park and stop the night in Cedar City. It’s a lovely drive and we are getting used to how little traffic there is on the roads out here, but, what we can’t get used to is the sheer scale, IT IS IMMENSE, and the way the scenery is constantly changing – round a corner and it’s changed again! 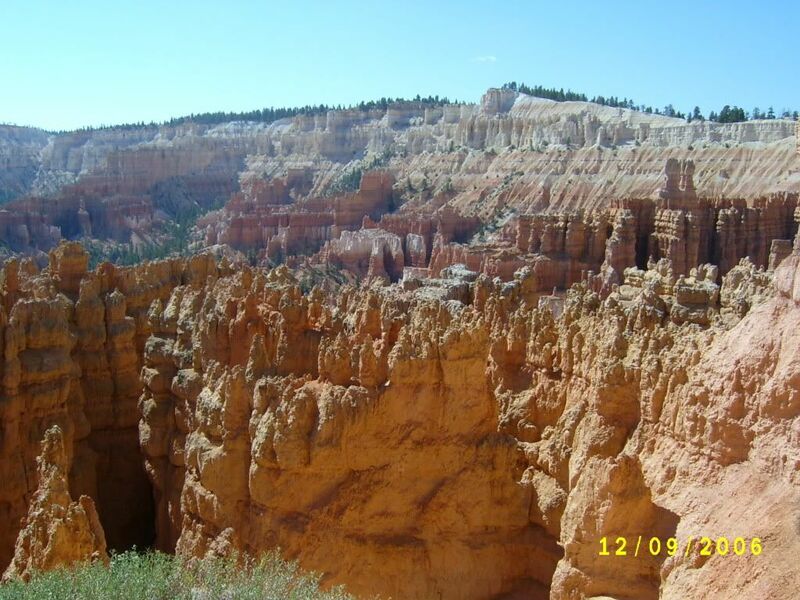 Cedar Breaks is very similar to Bryce Canyon, but with a lot more dead trees, which is down to a bug that eats into the trees, killing them, but, as it is part of the natural renewal process the Park Authorities just let it happen. We speak to a couple who recommend Muir Wood just north of San Francisco as an addition to our tour – we might just find time to do this. In Cedar City we drive up and down Main Street before deciding to stop at the Best Western Town & Country Motel in the centre of town, for the night We walk across the road to Sizzlers and eat there before going for a walk up the street in search of a beer. We fail dismally and return to our room and crash out. Up at 7am, we take a buffet breakfast in the reception of Best Western before leaving for Zion. Suzie’s navigation goes wrong from the outset, we are heading north when we need to be heading south. Then we are heading south on Interstate 15 when we want a cross country road. We find this back road only to discover that it isn’t a tarmac road, it’s dirty, dusty with lots of sharp looking stones. We don’t have time for tyre changing so turn around and end up leaving south bound on I15 anyway having done 30 miles going nowhere. Zion is different again to the parks that have gone before it. More wooded. More vegetation. Massive rocks. More commercialised but nice and environmentally friendly. We do another gorge walk to the Emerald Pool which turns out to be a dirty green puddle - talk about bigging it up. It was a great walk to a crummy pool. We hop back on one of the lpg powered buses that shuttle up and down the park and ride to the top, then change onto another and ride back to the car park. As we are driving out we stop at the trading post and get two enormous ice cream cornet (supposedly their smallest size) and these serve as our dinner for the day. Back on I15 south and we are now heading for Las Vegas, only problem is, we’ve not got enough fuel to get there. With 50 miles left to get there we are nearly out of go juice, but, we do find a gas station and fill up. What a relief! Down into Vegas and traffic jams, we get lost, then find the same place twice. First time round I go right so the second time round I go left which turns out to be the way we should have gone the first time only the navigator missed the signs. Virtually straight into the Aladdin, park up, check in, freshen up and then out onto the strip. We find the Coke Cola bottle booking office and get tickets for Mama Mia at the Mandalay Bay Hotel, and as we have to be there an hour before the show we walk off to that end of the strip, wander around their casino, find a bar and get two bottles of Budweiser for $12 – I don’t leave a tip. Mama Mia, the show was fantastic! Yes, we are right near the back but we have a whole row to ourselves and an uninterrupted view of the stage way down below us. Eventually we find our way out of the Mandalay Bay, taking the mono rail train despite not having a ticket. Off at the next stop by New York, New York hotel we cross the road and get to eat in Denny’s. By the time we get our food we are too tired to eat, so we pick away at it. However, the milkshake is fantastic and nearly a meal in itself. To bed – totally knackered. Up at 8am and straight out onto the strip. First stop Paris. $9 each to go up their Eiffel Tower, which, at 540 feet is a half size replica of the real thing. Still high enough to scare Suzie who froze as she exited the lift. After walking round the top and shooting photos we descend and continue down the strip. Next stop is breakfast – strawberry and cream slices and my first cuppa tea since leaving England. We carry on down the strip, in and out of hotels having a quick gander, watching the punters in the casinos, checking out the “made in China” memorabilia. 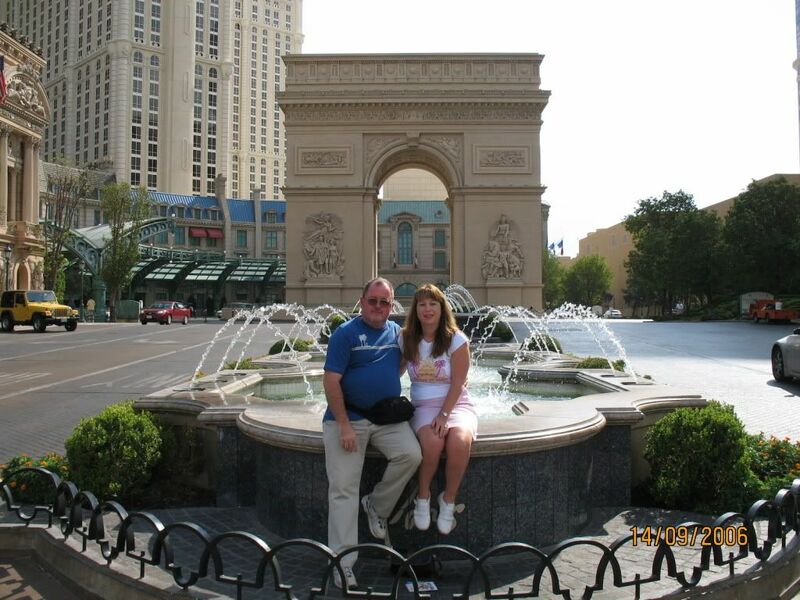 The Venetian is impressive but we finally decide that they are all much the same, a casino is a casino and casinos are boring if you aren’t a gambler. We lunch at Outback which provides a good meal and BEER! 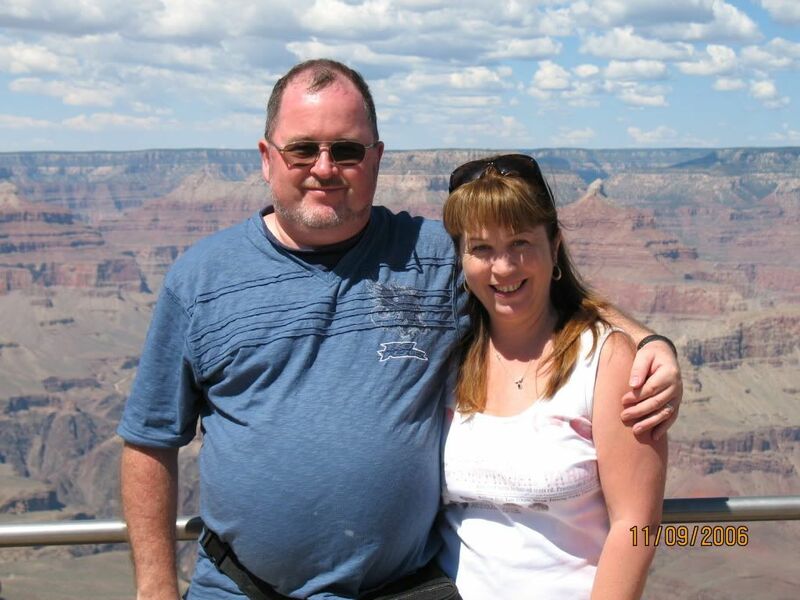 Suzie had a draught beer which earned her a giant size glass – you must see the photo! When we get to Frontier we find that they do the only bingo on the strip, so Suzie has to have a play. It’s quite a bit different to the way we play bingo in the Uk but the idea is the same. No wins today though. shown later in the year on cable TV, featuring amateur builders. I talk to a number of the folks round the displays and shoot pictures. We buy T-shirts and gifts for the boys, have a good walk round then jump back on the Deuce for the return trip. We get off too late for the Stratosphere and too early for Treasure Island so decide to miss the Stratosphere and walk to TI to see the evening show there. Just got there on time to be told that the wind speed was too high (it is a bit blustery) and the show has been cancelled. Foot sore we continue back to the Aladdin where Sue has a Tiramisu and I have a Jack Daniels before retiring somewhat foot sore. Up at 7:15 we packed our bags and left at 8:40 – would have been earlier but valet parking took 20 minutes to find our car. Drove down the strip past Fremont Street to Highway 95 and out to Boulder City and the Hoover Dam. We passed the Arlen Ness bike shop on the way and I would liked to have stopped but we’d got the dam to do and the journey to Santa Monica ahead of us, plus the deserted mining ghost town of Calico to visit en route (time permitting). The dam is a massive construction site as they are building a bypass over the dam with a raised Highway / Interstate. The dam is impressive and the water level behind the dam is low so after taking a few shots we decide not to hang around and set off over the dam to Highway 95, then H164, onto I15. Needing fuel and food we pulled off I15 to eat at Peggy Sue’s 50’s Diner. Good grub, excellent service in nice surroundings – a nice place with nice people. This is at the turning off the Interstate off to Calico but when we come out of the diner a sand storm is blowing and I had to refuel. Sand got everywhere, not nice. It takes 15 minutes to fuel up and we decide not to visit Calico which is just 3 miles away, and get back on the Interstate and away from the sand storm. 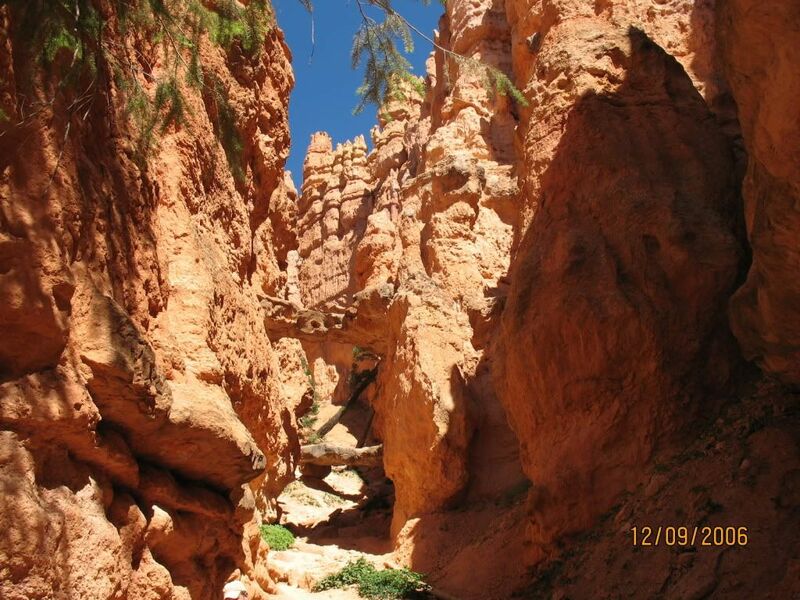 Bryce Canyon - view 2. 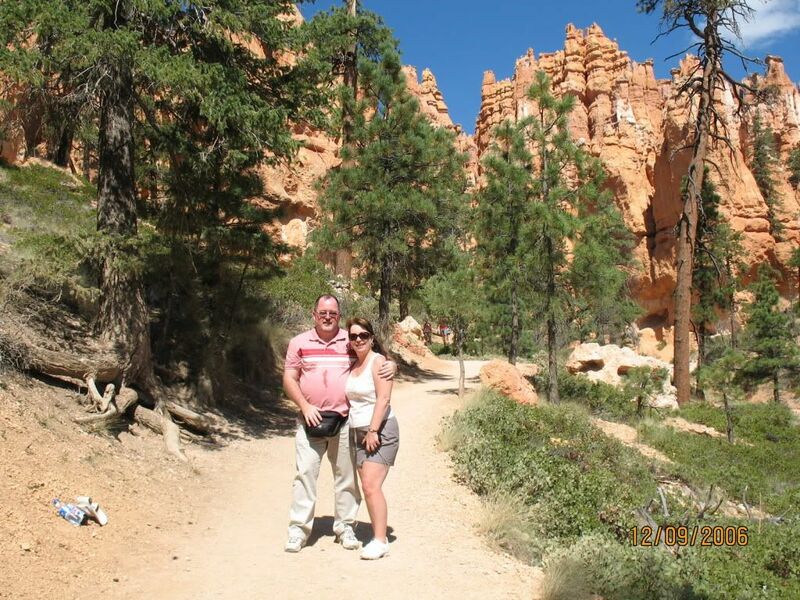 Bryce Canyon - we walked to the bottom, this is us on the way down. We continue down I15, then onto I10 to Santa Monica. We meet massive traffic jams trying to get out of Los Angeles but for us it is an easy and relaxed drive until we miss the turning for downtown Santa Monica (truth was we didn’t know which turn we needed) and end up north bound on the Pacific Coast Highway. After a bit of riding round finding our bearings and asking at a number of motels we end up in a Comfort Motel on 26th block on Santa Monica Boulevard (old Route 66) for one night. Got showered and cleaned up then went for a ride downtown. Fabulous, I love this place. We found a nice Pizza place that did beer as well, and pizza by the slice, one each is just right. We walk to an Irish bar – the place is buzzing, full of the younger set. I had a cider and Sue a Bud then back to the Motel having had a good day but having done some big miles – 376 in total which would turn out to be the most we did in a single day. A lie in this morning, we get up at 7:30 and while waiting we talk to some nice folks from Pennsylvania before we get picked up outside the Motel at 9am for a bus tour of LA. It’s a guided tour that takes in Rodeo Drive, Beverley Hills, Sunset Boulevard before heading out to see the Hollywood sign. Nice guide (TukaTukaBoomBoom) who owns a Kawasaki ZX10 motorbike. He drops us off at the motel on his way back so we pick up the van (already loaded with our things) and move for our 2nd night in Santa Monica, at a Travel Lodge back in Downtown on the sea front road. Nice view but otherwise a crap room (expensive too at $209 for the night which turns out to be the dearest room of the holiday). Leaving the van we walk down to the Pier which is virtually opposite the Motel. Paramedics were taking away a lass on a stretcher in a neck brace as we arrived. Lots of local police and a police helicopter is in the sky above us. She may have been attacked (we never find out for certain) but they appear to know who they are after. Anyway it turns out to be a nice pier with good views and several live entertainers. After whiling away some time we head off for a meal somewhere and find a Steak Grill / Café on Santa Monica Boulevard and we both had a stir fry chicken and veg on rice which was very nice but as usual the portions are way too big. It’s a bad night – there are girls in the room next to us and they spend hours noisily getting ready to go out, music blaring. They then get back about 5am with one very upset about something another is alleged to have done so they argue for hours then pack up and leave. What with that and the traffic we didn’t get much sleep. Getting up at 7:15 we leave without taking breakfast – DON’T USE ROOM 130, in fact, DON’T use Travel Lodge – we didn’t and won’t ever again. From the marina we walk south towards the pier which is another nice example with lots happening. On the beach by the pier there is a load of wooden crosses in the sand – a memorial to the dead from the Iraq War. 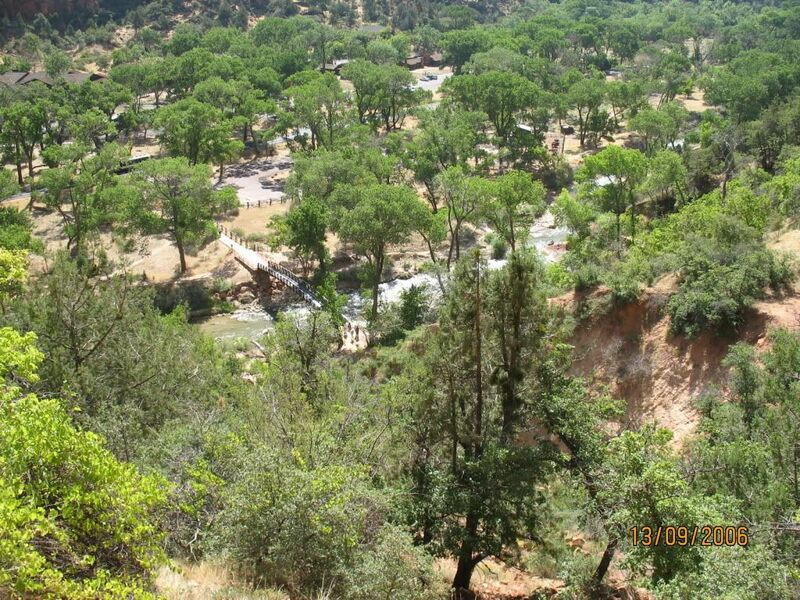 This is a quiet protest by ex-veterans Bryce Canyon - the "Two Bridges" on our way down I took this looking back up. 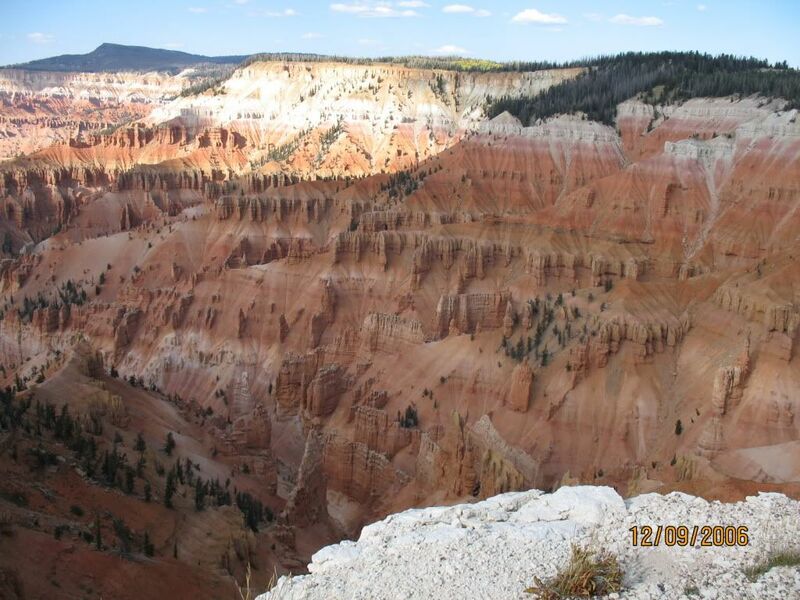 Cedar Breaks National Park - spectacular views. and we take it all in, shooting some photos for later reference. After a stroll up and down the pier we head off up State Street (their main/high street) We found a place to eat at later and have a good wander round before heading back to motel to freshen up. We take the van back down town finding some free parking before going off to eat at Puscucci – an Italian restaurant which is a very nice place to be. Suzie had wine, I had a beer and we both select lasagne. Unfortunately mine isn’t properly cooked and has to go back but we both enjoy our meals, which Sue finishes with another tiramisu but, her eyes are bigger than her belly so she ends up taking it away in a doggy bag. As the sun was going down by now, we took a drive south along the coast road away from our motel. We observe some very “smart set” at an outside do (looks like it was a wedding reception) then passed a VERY SMART hotel, and drove to the road’s end before turning round and back to the motel to end the day with a much better night’s sleep. Up at 7:30 we breakfast, refuel and head out onto CA101. We make several attempts to follow PCH but give up and stick with CA 101 through Santa Maria, San Luis Obispo to Morro Bay. Driving CA 101 is much the same as any interstate anywhere so we decide on a change of plan as we didn’t like Morro Bay enough to stop there (the plan) so decide to continue on up PCH to stop the night in Carmel. It’s the right decision. Lovely road, nice and interesting with plenty to see and lots of stops for photo opportunities along it’s 100 mile length, along which we see loads of vineyards, fields of strawberries and mounted cowboys. We are blessed with glorious sunshine along most of the route except near Big Sur where there was sea mist. We pass an “Iron Man” competition and are amazed to see such a large number of ordinary, over-weight people taking parts alongside the expected super thin athletes. We even managed to stop for a beer so things are looking up. We drive into Carmel at around 4pm and it was solid, the only real “English” traffic jam of the holiday so far. It turns out that they are re-surfacing the main road down to the beach which was closed so all traffic was looking for alternative routes and there are no detour signs. We can’t be bothered with all the hassle so carry on to Monterey. A good choice. Lots of motels, a nice clean looking place with a swish looking marina and bay area. Typically we get lost in the one way system but come across the local police station and two officers (big lads) fuelling the patrol cars, so I ask the way. We didn’t get locked up and it turns out we are only ½ mile from where we want to be and they give us a map to help us find our way around. Found a nice room in another Comfort Motel. While Suzie has a nap I work out that so far we have done 1,755 miles and there is still 5 days left in the holiday so my original estimate of 1,800 miles is looking a little on the optimistic side as it looks like we’ll now end up doing another 2,100 miles at this rate. Never mind, it’s easy going and so far only one mistake – the Travel Lodge in Santa Monica. The evening sees us taking a short drive down into downtown Monterey where we find an “English pub” which is owned and run by an English couple. We have a simple meal and we both manage a desert. Nice sized portions, and cider (again) for me. We walk off the meal down on Old Fisherman’s Wharf – Monterey is lovely and again we have made the right decision. Suzie buys an anorak (because we keep getting told that San Francisco is cold and we will need them) before returning to the motel and room 166 for the night. Up at 7:30 (again, this is becoming a habit) we have waffles for breakfast – my first. Basically pancake mix heated in a funny shaped / patterned griddle. OK though. We head back down town and walk to the Wharf so that I could buy a jacket like Suzie’s. Then we hit the road for Yosemite. It’s easy driving through ever changing scenery. Lots of agriculture; almond, cherry, peach and orange trees and strawberries (with migrant labour pickers) and always with a mountain backdrop. Zion National Park - Somewhere down there is our van and the Zero emission buses that shuffle tourists about. We stop in Los Banos for fuel. Then later we stop at Maripodsa for a walk, to visit the restroom and a bottle of pop. I dropped my credit card but didn’t notice until I tried to pay for a hotel room 25 miles up the road. This means a quick about turn to drive back and collect it, luckily no damage done. We get lucky on the accommodation front though and we get the last non-smoking room (3035) in the Yosemite Lodge View, which is just outside the Park entrance. After freshening up we drove into the park, stopping in a lay-by to climb down to a small “beach” by the side of a rock pool. Suzie paddled and said it wasn’t too cold. We motor on and again stop, this time by Cathedral Rock and we walk to Bridal Veil waterfall. I film an owl bathing and squirrels feeding. Later we visit Yosemite village and shops and we see a young deer standing by the roadside watching the traffic passing by as we head back to the hotel. After freshening up again we go down to the on-site restaurant for dinner. While waiting we get talking to a couple, Le-Anne and Lim from Maryland, and are invited to join them for dinner, which we do and it is most enjoyable. Good grub and good company – who could ask for more? Up at 7:30, breakfast at the YLV restaurant and leave for Glacier Point at 9:30 after saying our farewells to Le-Anne & Lim. Glacier Point, what a view! 3,000 feet straight down. Magnificent views across the park and down into the valley. We drive down to Mariposa Grove and take a walk up one of the trails – 4.5 miles in total (up and down). Loads of nature happening all around us. Squirrels, chipmunks and deer (a mother with 2 fawns). 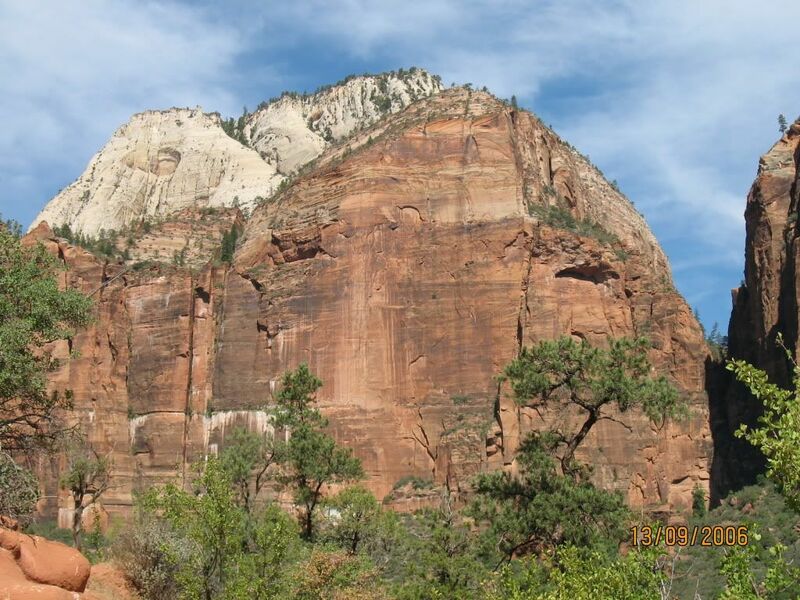 Zion National Park - It has loads of big rocks like this (all have names). 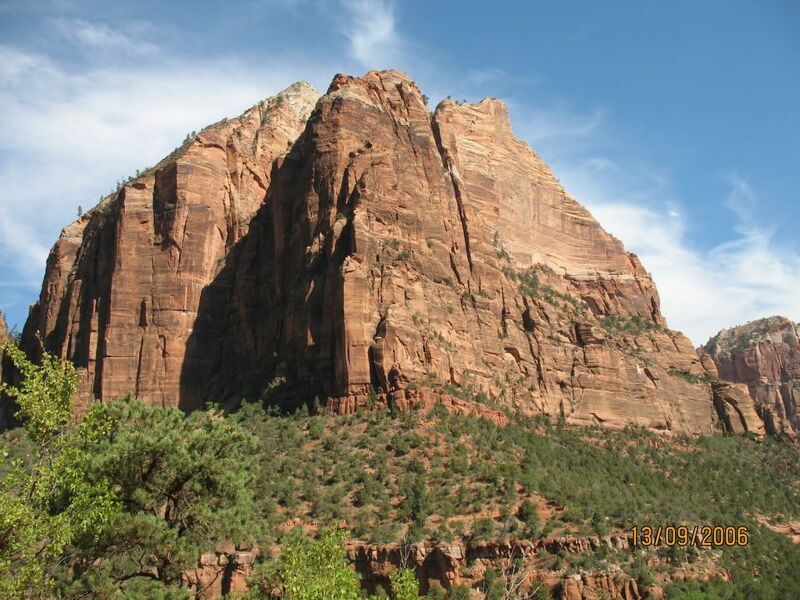 Zion National Park - another example of Zion's big rock formations. We shoot lots of photos and video then return to YVL and a Pizza tea before going up to Yosemite village for some shopping. On the way back we see a young bear by the roadside – all we need to see now is a mountain lion for a full house. Suzie says she’s got man-flu! Bird-cold more like. Again we are up at 7:30, we get packed and drive into Yosemite NP and onto highway CA 120 out of the park and heading for San Francisco. It’s another lovely day – bright and clear and quickly warming up. The run through the park is mesmeric and awe inspiring at the same time. Even as we get out of the park the road continues to demand concentration. So much so that I ignore filling stations in the small towns that we pass through and we nearly run out of petrol, eventually find a small filling station run by a Kiwi in the middle of nowhere charging a fortune for gas (at $3.49 per US gallon it’s the dearest of the holiday). Down through Oakdale (where we stop at a Jack in the Box for breakfast) and onto the six lane Interstate system that delivers us into San Francisco. What a sight. Like the parks it’s totally beyond description, but, for different reasons. The bridges. The skyline. The skyscrapers. The mix of colour, of light and shade. With little difficulty and only asking for directions once (again two police officers) we find the Wharf Inn and unload. Then out exploring the sights and sounds of San Fran. We walk miles. In and out of shops. Up and down Pier 39. Photograph Alcatraz and the bridges, before getting a meal on the pier. On the way back to our room Suzie stops to buy a leather jacket but the cashier has a problem with the till and the Visa card on Sue’s transaction so we agree to go back later to pay for and collect both jackets. We head off to bed. Again we are up at 7:45 after a disturbed night being woken up by trucks delivering locally, motorbikes with loud exhausts and cars with thumping stereos, all visiting the 7-Eleven across the road. We walk down to Pier 39 for crepes for breakfast. Sue has banana and I have chocolate chip. We call in and collect our jackets and just as well we did. The cashier remembers us and so checks the transaction from yesterday – it’s gone through even though the machine had a fault. I make my selection and buy my jacket at a very good discount and it’s not until we get back to the UK that we find that all the jackets bought do up on the UK ladies side – oh well! We get picked up from our hotel for the city tour, but, the connecting coach turns up late because of a mechanical fault with the door mechanism. A little late we set of with Robin our driver/courier. He’s a local and obviously loves his job, the city and the people. A great guy who has been all over the world (England included). First stop is the Golden Gate bridge (with smoke in the background from a forest fire just off to the north of the bridge) then the city park, then a photo shoot at some houses. Robin is full of facts, figures, dates gossip and such like – Brilliant! Having completed the city tour we take a cable street car up into the Chinese District, then walk back down again window shopping all the way. We stop in a bar for a beer. Back out in the street we meet a lovely couple from Kansas. I take a photo of them on their camera and they take one of us on both their camera (of us “lovely folk from England”) and mine. 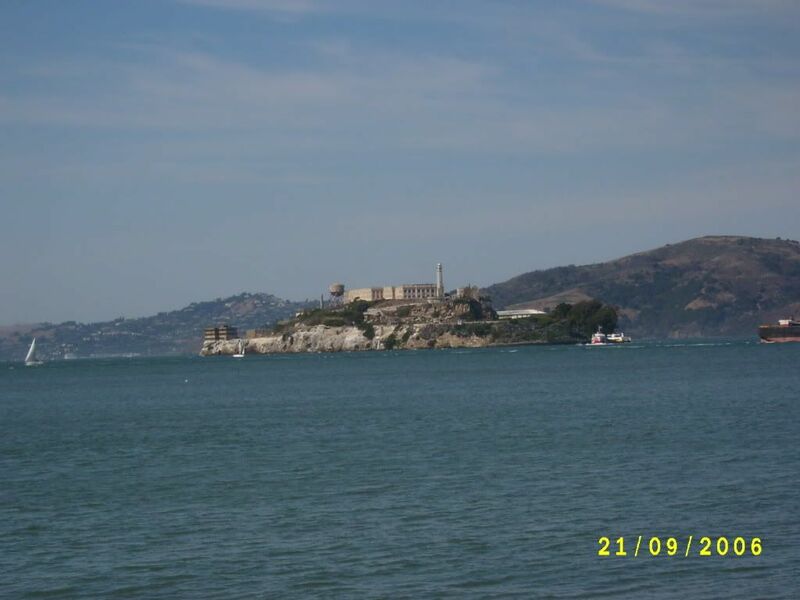 Then we do some retail therapy so that with final pressies bought we get ready for the Alcatraz tour on the Blue & Gold line. We board by Pier 41, it’s a lovely clear but cool evening with a stiff breeze. The views of SF and the GGB are fantastic from out on the water and the bout goes out and round the island in a clock wise direction before pulling into the pier on the island. We are split into groups of 60 and picked up by a tour guide – ours being an Indian who looks surprisingly like an Indian Scout would have looked in years past. Zion National Park - Sue in front of the Trading Post on the road that is both entrance & exit to the Park. 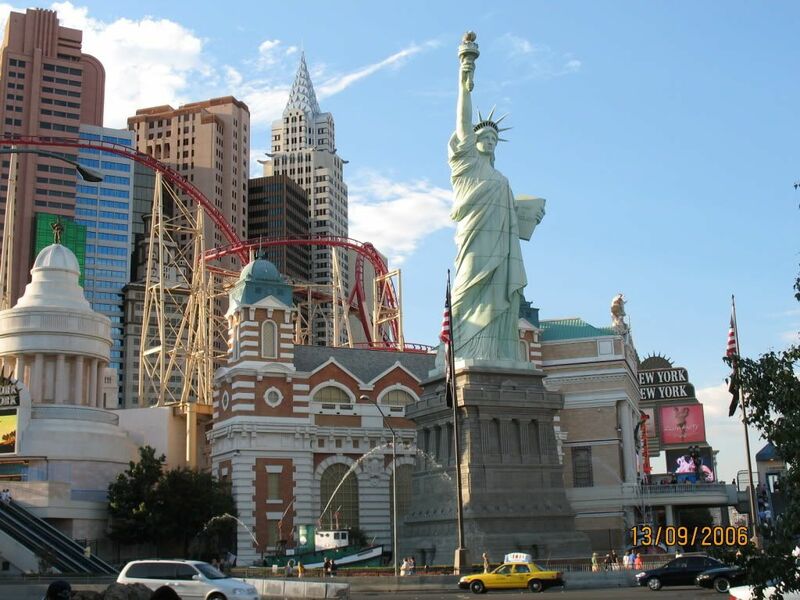 Las Vegas - New York, New York. Everything in Vegas is done on a grand scale, but it's all just glam. We ascend via a number of stops where we are given stories of past happenings that build an insight as to life on Alcatraz, before arriving in the main cathedral building where we are issued with audio tour kits to complete the tour of the ex-prison at our own pace. By the time we finish it is gone 9pm and dark as we walk back down to the pier and the boat. 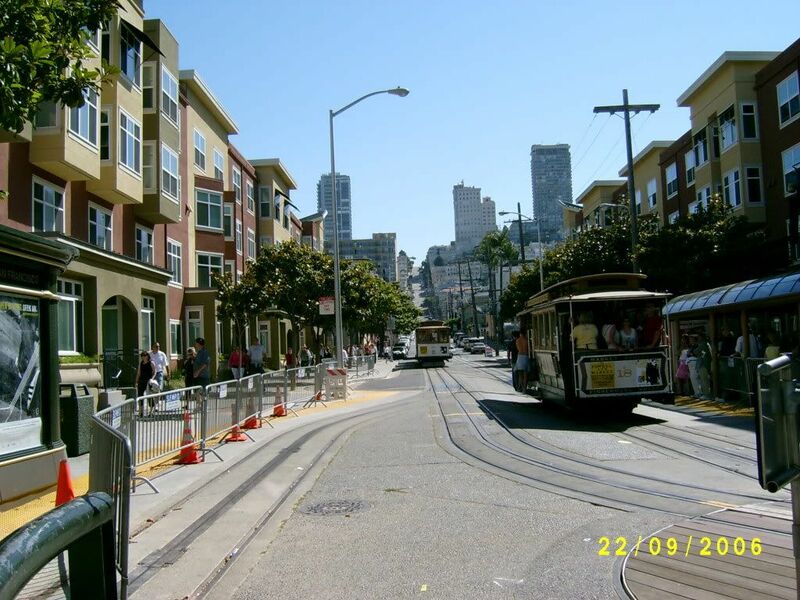 On disembarking we take a stroll along Fisherman’s Wharf and Bay Street just taking in the atmosphere. We’ve only seen a small part of SF but we both really like it and could happily return. A lay in, we get up at 8am, load everything into the van and check out of the room after checking that we can leave the van in the car park for a while. Again we go down to Pier 39 for breakfast and decide that we have more time than money left so we’d be better off doing Muir Wood that window shopping and walking the streets of SF. We set of, crossing the GGB and finding the turning off the CA 101 towards Muir Wood, just at the point where the fuel gauge plummets down to not much at all. We have no option but to turn around in search of fuel. Nine miles later we have refuelled and head back into Muir Wood. It’s small car park is packed but we get lucky as a car pulls out of a space right in front of us and we nip in. There are a number of hiking options available and with a few hours to kill we decide to take one of the longer ones (but not the longest). Part way round Sue hears a sound that turns out to be a young stag deer grazing with a female. Other hikers join us as we watch them slowly move away from us as they graze. The walk completed we head back towards SF. We try to find somewhere to stop at Manzanita by the shoreline, without success – it’s all privately owned and there are clamping signs everywhere, so we move on. Back across the bridge we decide to eat and then head out to the airport. We stop at Mel’s 50’s diner for a real American dining experience with massive portions served by a massive waitress in a diner that looks like it came straight off a film set. Our meal done we head out to the airport, dump the van which is showing 2409.7 miles clocked since collection, and trek into the airport, eventually finding the check-in desk after walking what seems like (and was) miles. Through the security checks and into departures where we install ourselves in a café area with a cuppa and a cake each, watching planes come and go. It’s a long flight back home, and boring. We land Sunday morning, collect our luggage find our bus stop. Just over ten minutes waiting and we are collected and taken back to the car parking where our car awaits us, complete with a nearly flat rear tyre. We set off and find a garage where I put in some air and we drive back nice and steady, still in USA driving mode which is no where near as cut and thrust as here in the UK. The holiday’s over – we’re back. Las Vegas - this shot cost us $5. Locals walk up and offer to take pics then ask for cash before they hand back the camera. 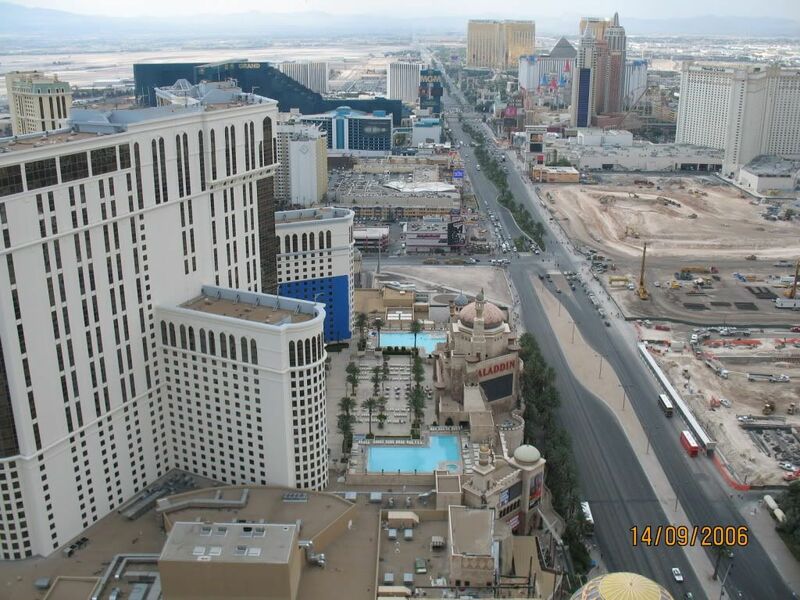 Las Vegas - The Strip from the top of the Eiffel Tower, we stayed at the Aladdin. 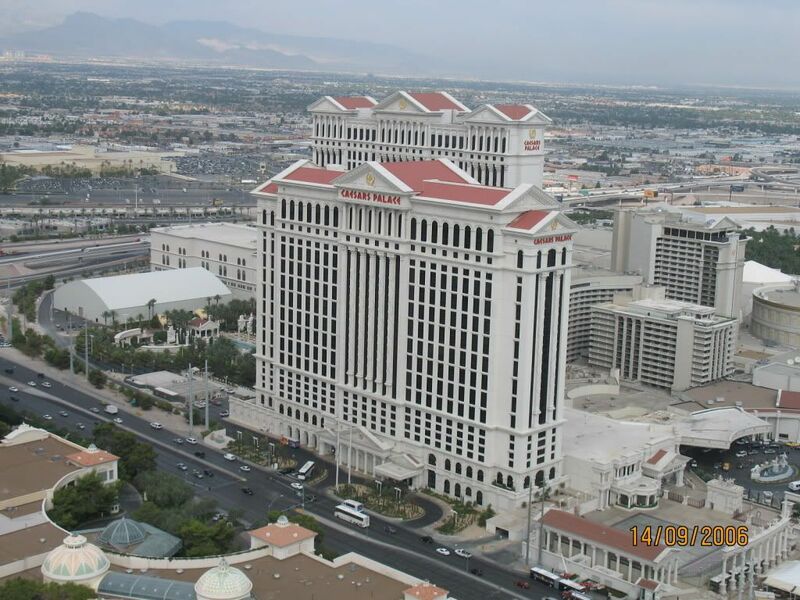 Las Vegas - Caezars Palace. 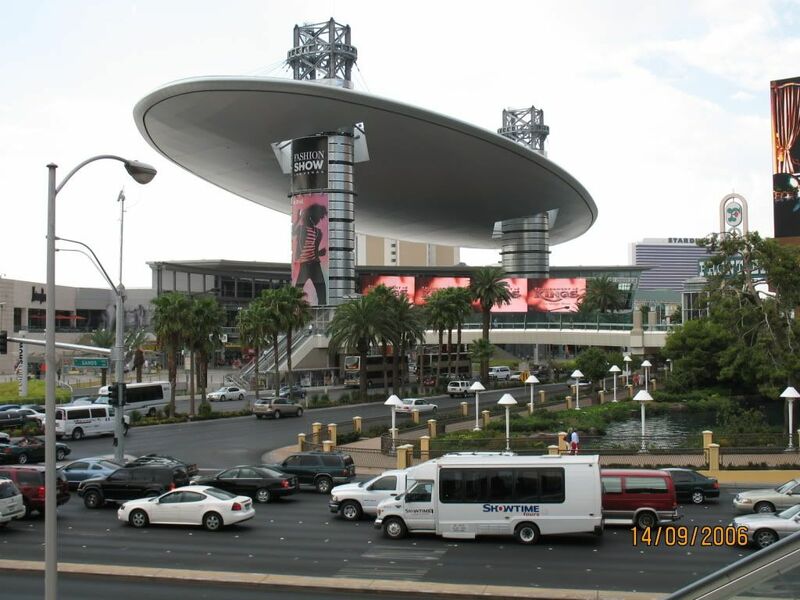 Las Vegas - The Strip, down at street level. 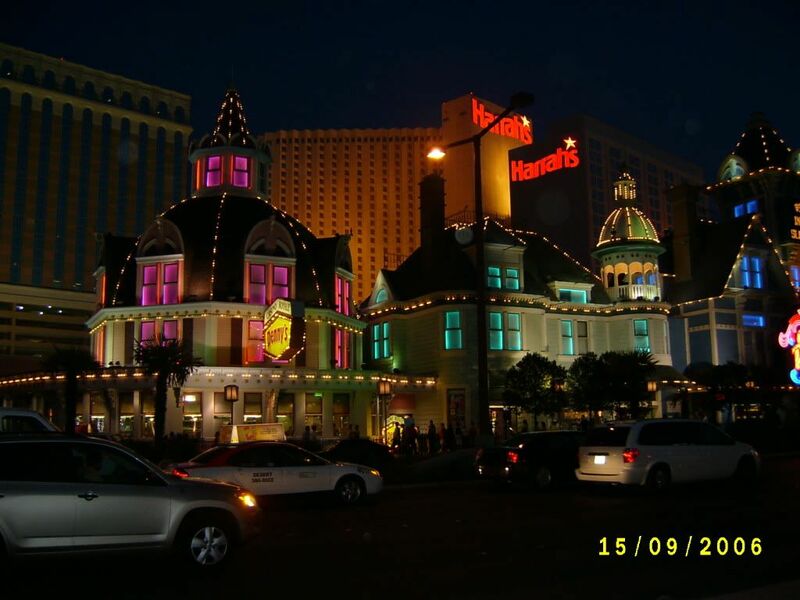 Las Vegas - The Strip at night. 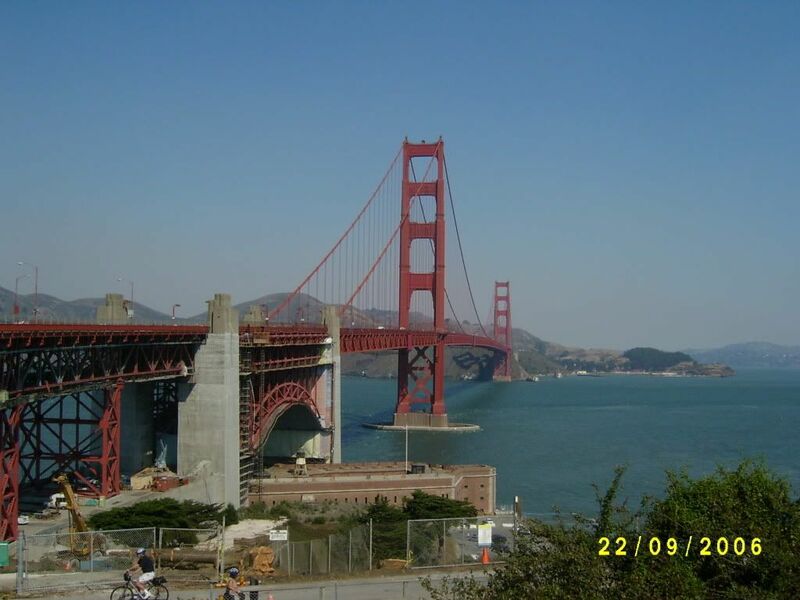 San Francisco - Golden Gate Bridge. 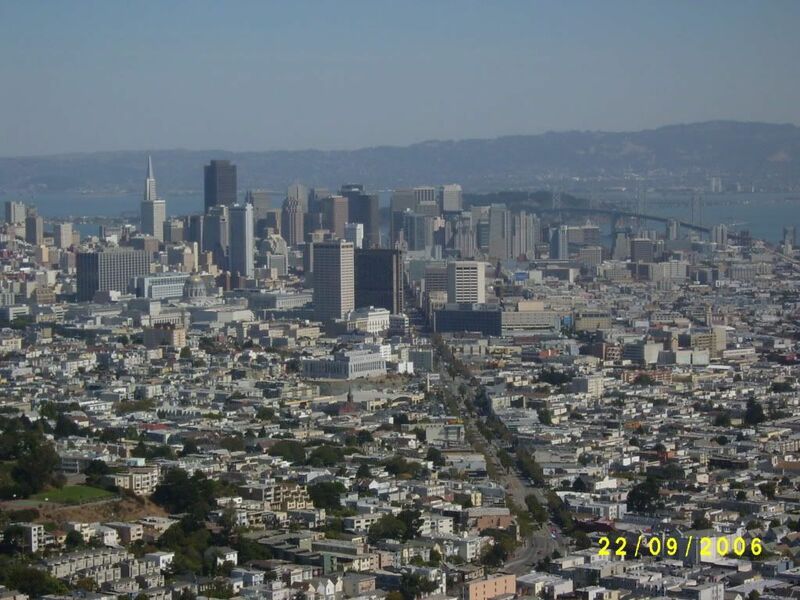 San Francisco - The fabulous city.